Corner close-up of the Helix mattress. 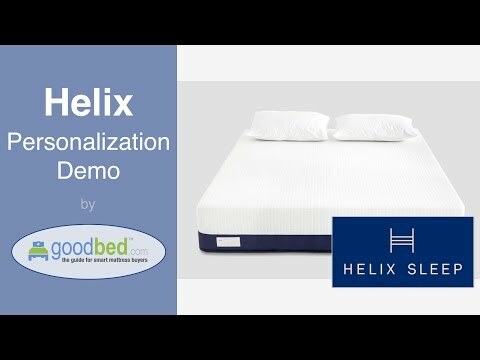 GoodBed's demo of the Helix personalization system and ordering process. GoodBed's test of the heat retention and cooling properties of the Helix mattress. 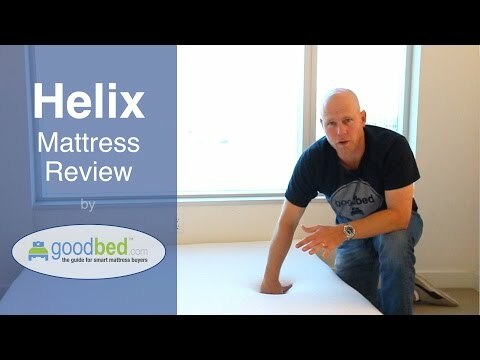 GoodBed's unboxing and set-up of the Helix mattress. We believe that the world is made up of individuals with different wants, needs, and styles. And being who you are starts with how you sleep. That's why we use your body type and sleeping preferences, combined with the world’s leading research on sleep ergonomics and biomechanics (which is just a fancy way of saying “mattress science”), to optimize your Helix Mattress specifically for you, by you. The right mattress personalized to you, backed by cutting-edge technology. 1/3 the cost of traditional retail. Made-to-order and received within 7-10 business days. Dual comfort & blended options for couples. 10 inches of premium quality materials including high-grade foam & microcoils. Free shipping in the USA, 100 night risk-free trial, & financing available. Helix mattresses are recommended by 55% of owners on GoodBed (based on 210 ratings + 4 reviews). Do you have something to say about your Helix mattress? Write a Review! Cover Details: Each mattress comes with a top cover layer with stretch and a soft touch as well as a lower cover layer for airflow and breathability. Third Comfort Layer Details: Providing ergonomic support and cushioning, the transition layer has a higher IFD to match your body type. Extra support. Second Support Layer Details: The bottom foam layer of the mattress provides base support and durability to the entire mattress. Note: The product line specifications above were derived from the active Helix models listed on GoodBed. As a result, these details may not be comprehensive and may not apply to all Helix models. If you are seeking specifications for a particular Helix mattress, please search for that mattress by name on GoodBed, or check with your local Helix dealer. Which mattress from Helix is best for you? Before shopping at Helix, take a short quiz to find which of their mattresses best matches your unique needs and preferences. Powered by GoodBed’s intelligent matching technology, you can even get your personal match score for each of Helix's available mattresses, in addition to other online options that match your criteria. Helix is a mattress manufacturer founded in 2015 that is based in New York, NY in the United States. Have an update or correction to our information about Helix? If so, please take a moment to suggest an edit. Helix mattresses sold by Helix come with a 100-night in-home trial. 100 day trial period with free returns, including in-home pickup from Helix. No return or exchange fees. Helix mattresses are only available online.